Indian cricket legend Sourav Ganguly has been named as ambassador for Team India at the Street Child Cricket World Cup, which will feature four children in HOPE's care. Ahead of the ICC 2019 Cricket World Cup, 9 teams of street girls and boys from across the world have an amazing opportunity to come to London to compete in their own Cricket World Cup event, from 30th April to 7th May. The Hope Foundation and our partner Save The Children have been invited to bring a team of street connected children to represent Team India North. As well as being an exciting sports event that will attract global media attention, SCCWC will provide an international platform to raise awareness of, and tackle the stigma and negative treatment often faced by street connected children. The young people selected to participate will have a unique opportunity to build their confidence, teamwork and leadership skills and, most importantly, will be given a voice for street children worldwide. 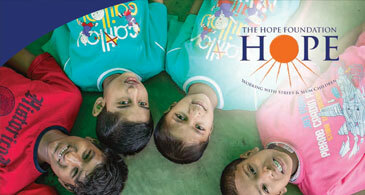 The Hope Foundation works with some of the most disadvantaged children in the world today. Set up in 1999 to raise funds for one girl’s home, The Hope Foundation is now a registered Irish charity with offices in Ireland, India, the UK, Germany and the USA. 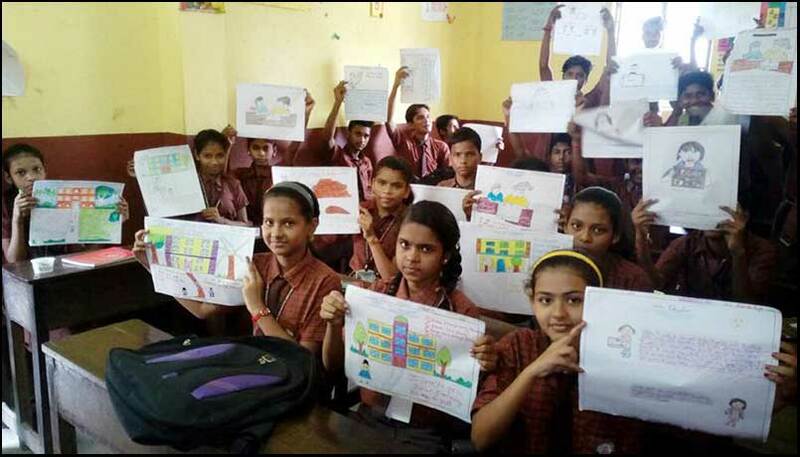 In the past decade, The Hope Foundation’s extensive work has been considered critical in ensuring the rights of the underprivileged sections of society, specially the street and slum children of Kolkata (formerly Calcutta), India. Living on the streets, the children are exposed to acute hunger and severe physical and sexual abuse. Those who survive are left to fend for themselves, with no promise of a safe future. They are forced to work from as young as five years of age to earn money for food and so cannot go to schools. Hope works to free them from lives of pain, abuse, poverty and darkness. 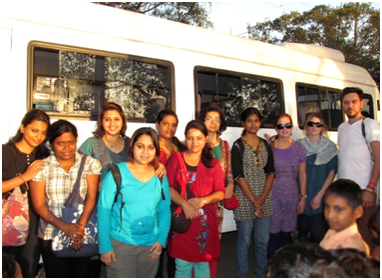 The Hope Foundation has a varied range of projects that ensure basic rights of the underprivileged population focussing mainly on the female and adolescent. The mission of Hope Foundation is to improve the quality life for the underprivileged section of the society by providing their basic human rights. The organisation has identified the following priority issues. For Street Children in India, the street (in the widest sense of the word, including unoccupied dwellings, wasteland, etc.) has become his or her habitual abode and/or source of livelihood; and who is inadequately protected, supervised, or directed by responsible adults. 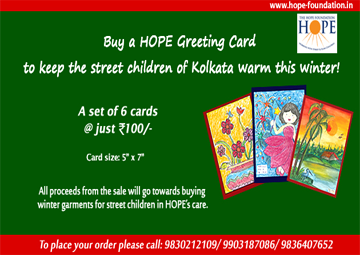 The Education Programme of Hope Foundation directly benefits, 2179 children living the streets and slums of Kolkata and Howrah, including 10 Special Needs living in the Children’s Home, and 136 children living in the under developed tribal region of Birbhum District, West Bengal. The Community Fund initiative allows the community to save money and spend it in the most effective way for the community as a whole. 35 such funds have been created. Community Health Volunteers of respective areas started collecting small amounts from the community. The total collection in the Community Fund is INR 76,705 (approximately €1,279). Regular community meetings have been conducted to increase the collection and now the communities are ready to open a bank account for safety and security of the fund. In today's India, growing urbanisation, migration from rural areas and the disintegration of the traditional community structure have changed the social economic scenario and given rise to a new, vulnerable group of children in the metropolitan cities called "street children". HOPE invites each individual to join the Friends Club. Each individual can contribute towards the common vision. Your Donation could help the underprivileged realise their potential and see the brighter side of life. Winter is just knocking on our doors & as the winter arrives, we all will be busy getting ready. Education support for 100 vulnerable & needy children in Kolkata, West Bengal, India. For children studying in Clasess I-IV, each child's educational sponsorship costs Rs.12,500/-. You, your family and friends can sponsor as many as 35 children in this Slot. Or just one child's education will also be fine. For children studying in Clasess V - VIII, each child's educational sponsorship costs Rs.15,500/-. You, your family and friends can sponsor as many as 35 children in this Slot. Or just one child's education will also be fine. For children studying in Clasess IX-XII, each child's educational sponsorship costs Rs.16,500/-. You, your family and friends can sponsor as many as 30 children in this Slot. Or just one child's education will also be fine.